The Atlantic 10 doesn’t have football, not as a conference at least. We do however have basketball players that I sometimes imagine are football players…fantasy football players, if you will. It’s still technically the offseason for us here at A10talk.com, so why not…my A-10 football all-stars if basketball players played football: offense edition. QB – Micah Mason (Duquesne) – I need a QB who can thread a needle with his passes and hit his targets from deep. Mason shot a ridiculous 56% from range last season and at 6’2 180 is at least taller than Drew Brees. HB – Kendall Anthony (Richmond) – Darren Sproles went nuts last night on Monday Night Football, so if the 5’6 K-State grad can do it I’m gonna roll the dice on the shifty 5’8 Kendall Anthony. He might not run anyone over but I love his ability to catch passes out of the backfield and turn them into points. FB – Jarred Terrell (Rhode Island) – Do fullbacks still exist? I’m not sure they do, but if they did (as they would on my throwback style team) the 6’3 220-pound freshman Terrell would be clearing paths, catching balls and diving over goal lines for our team. Terrell is built like a rock and would be a dangerous option and blocker out of the backfield. WR – Briante Weber (VCU) – One of the fastest and quickest men in the A-10, Weber would be my deep threat as he possesses a 45 1/2′ vertical jump. If a cornerback intercepts the ball he will simply steal it back. WR – Hassan Martin (Rhode Island) – If the Detroit Lions’ Calvin Johnson is “Megatron” at 6’5 235, maybe Martin could be “Ultratron” at 6’7 210. Martin has a crazy combination of size, strength and speed that would provide a nice complement to Weber. 3rd and 7 near in the redzone? Just throw it up to Martin and let him go and get it. TE – Mo Alie-Cox (VCU) – This one is obvious because the guy has literally already had NFL scouts at his college basketball games. At 6’6 250 with baseball glove hands, Alie-Cox is Antonio Gates on steroids except not actually on steroids. Crazy that this is a real future possibility as well. LT – Kevin Larsen (GW) – I need a big guy who can move a bit to protect my QB and who better to do so than the Danish Larsen? He’s got the size and the power but also possesses enough quickness to keep those speedy defensive ends from the valuable yet fragile arm of Mr. Mason. G – Jai Williams (Saint Joseph’s) – Football guards are typically shorter fat guys but all of our basketball beef “unfortunately” comes with some height. At 6’9 262 Jai will clear some holes for my man Anthony to run through. 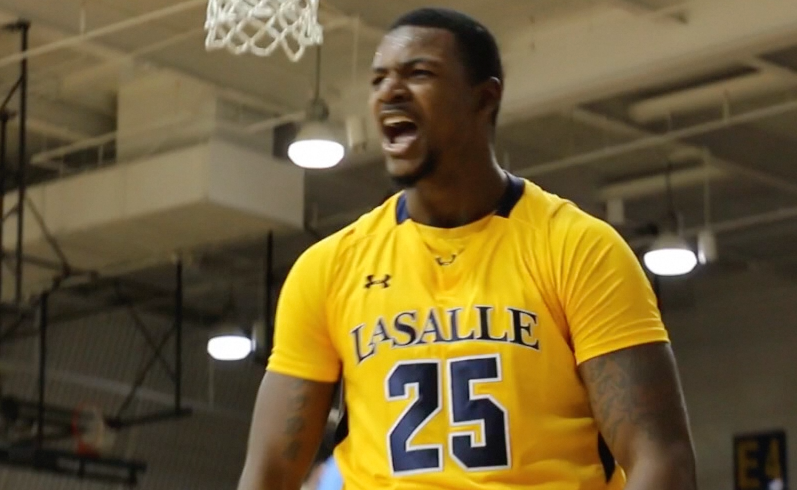 C – Jerrell Wright (La Salle) – Obviously gonna be a challenge seeing over the 6’8 245 Wright, but he’s got the size and the brains to be the guy starting off each play. A few less sprints and a few more trips through the buffet line and Wright will have the PERFECT football body. G – Earl Watson (Rhode Island) – 6’7 250 lbs, you’re in. Watson also hails from Florida, the state responsible for more NFL Draft picks over the last three years than any other. You don’t get to be that large, from Florida and have no football background. Great pickup for our team. RT – Cady Lalanne (UMass) – Similar to Larsen, at 6’10 253 Cady would be a ton of fun to run behind while also having the reach to throw defensive ends off of Mason’s path. Just watch him throw 6′ linebackers out of his way as Kendall sprints toward the end zone. Offensive Coordinator – Archie Miller (Dayton) – Not only does “Archie Milller” sound like a football coach, but Dayton’s 106.6 offensive efficiency rating led the Atlantic 10 this past season, all the way to the Elite 8 no less. I want him calling the plays on offense. @A10Talk Erik Copes should be a DT. (Actually, he’s lost 40 lbs., so that might not fit him anymore). @A10Talk @TheArenaWUDR Steve McElvene is HUGE and has played football. Also, Devon Scott would be a good TE and Sibert a good WR. @TheArenaWUDR @A10Talk No doubt. Never said over the guys who picked. Just tweeting a few guys who would be good from UD. @VCUBatman @A10Talk I also assume Shaka will be defensive coordinator. Robbie King liked this on Facebook.